New Zealand activist Jen Bell recently attended the Zapatista Women's Encuentro in Chiapas Mexico. 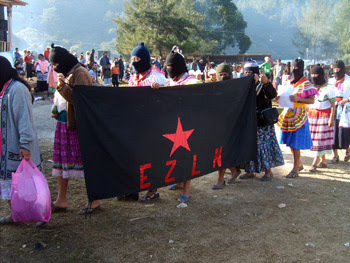 To celebrate the 14th anniversary of their New Years Day uprising, Mexico's Zapatista National Liberation Army (EZLN) hosted a Women's Encuentro ("encounter" or "meeting") at the jungle settlement of La Garrucha, Chiapas state. Officially dubbed the "Encuentro of the Indigenous Zapatista Women with the Women of the World," the meeting brought together women from throughout Mexico and several other countries around the globe. Jen Bell attending Women’s Encuentro in La Garrucha – funds to be deposited in her NZ account so she can draw on them over there and deliver them directly to the health co-ordinator of the Junta de Bueno Gobierno at La Garrucha. Zapatista Women’s Encuentro – Jen Bell is attending this event, and also going to do some human rights observing in Zapatista Communities. Decided that LAC would provide a letter of support endorsing Jen Bell as a LAC member in good standing for her volunteer activities in Zapatista communities. Also decided to send a message of support from LAC to the Zapatista women and women of the world at the Encuentro. Action: JWP to draft letters. Jen Bell has been active in the Save Happy Valley Coalition with "Urewera 17" arrestee Tim/Ira Bailey. She has also been active in the Wellington Zapatista Support Group with Bailey and Cuban linked "independent" journalist Julie Webb-Pullman. In mid 2006 Jen Bell also travelled to meet the Zapatistas in Chiapas, with Bailey and Webb-Pullman.